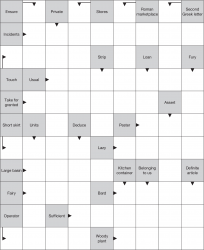 Arrow Words are crossword puzzles where all of the clues are written within the grid. The titular arrows reach out from every clue to point to where the solution belongs in the grid, as you can see in the example to the right. 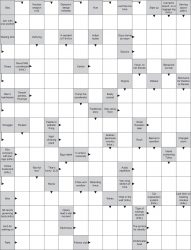 Compared to UK-format crosswords there are usually far more overlaps between words, somewhat more akin to a US-style crossword. 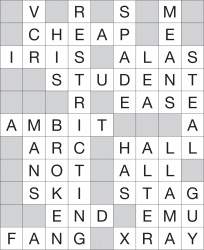 This can permit harder clues for a similar level of overall difficulty if desired, particularly where every letter of a word is crossed by another word. 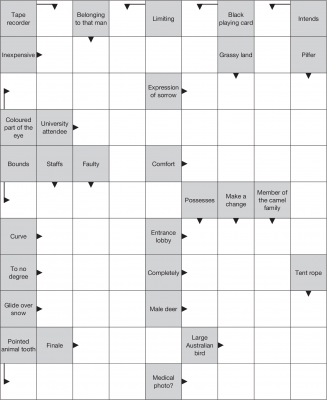 Arrowword puzzles need not be rectangular or square but can easily be shaped to fit a particular area or pattern, and can contain cut-out areas where pictures or other items are inserted.